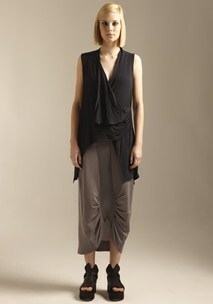 This sleeveless top features a front draped cowl neckline that has tucks on the front waist. The front drape panel has a small press stud on the wearer’s left shoulder to enable the drape panel to be worn open or draped up to the shoulder to create a cowl effect on the front. 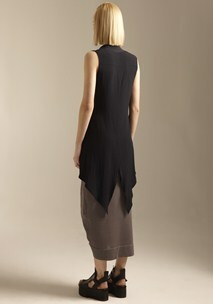 The garment is shorter in the front and extends to longer tails at the back. 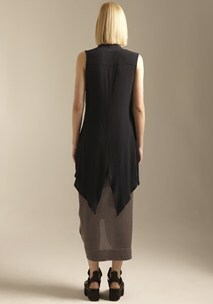 Can also be worn as a vest with a mesh or fine jersey top underneath. 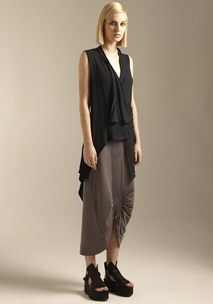 This garment has been garment washed to give the fabrics a more textural effect and to provide easy care.